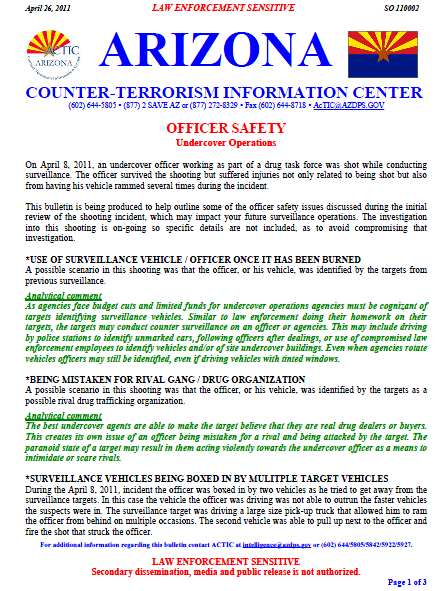 On April 8, 2011, an undercover officer working as part of a drug task force was shot while conducting surveillance. The officer survived the shooting but suffered injuries not only related to being shot but also from having his vehicle rammed several times during the incident. This bulletin is being produced to help outline some of the officer safety issues discussed during the initial review of the shooting incident, which may impact your future surveillance operations. The investigation into this shooting is on-going so specific details are not included, as to avoid compromising that investigation. A possible scenario in this shooting was that the officer, or his vehicle, was identified by the targets from previous surveillance. As agencies face budget cuts and limited funds for undercover operations agencies must be cognizant of targets identifying surveillance vehicles. Similar to law enforcement doing their homework on their targets, the targets may conduct counter surveillance on an officer or agencies. This may include driving by police stations to identify unmarked cars, following officers after dealings, or use of compromised law enforcement employees to identify vehicles and/or of site undercover buildings. Even when agencies rotate vehicles officers may still be identified, even if driving vehicles with tinted windows. A possible scenario in this shooting was that the officer, or his vehicle, was identified by the targets as a possible rival drug trafficking organization. The best undercover agents are able to make the target believe that they are real drug dealers or buyers. This creates its own issue of an officer being mistaken for a rival and being attacked by the target. The paranoid state of a target may result in them acting violently towards the undercover officer as a means to intimidate or scare rivals. During the April 8, 2011, incident the officer was boxed in by two vehicles as he tried to get away from the surveillance targets. In this case the vehicle the officer was driving was not able to outrun the faster vehicles the suspects were in. The surveillance target was driving a large size pick-up truck that allowed him to ram the officer from behind on multiple occasions. The second vehicle was able to pull up next to the officer and fire the shot that struck the officer. Attempt to get the history of violence involving your target when possible. Due to rapid changes that can occur during a surveillance operation this is not always possible but should be a consideration at all stages of a surveillance detail. This is of extreme importance when conducting surveillance of a target for another agency or jurisdiction. If the surveillance involves a target from another state have the contact person from that jurisdiction advise of any past violence involving the target or their organization. Having surveillance vehicles comprised of one, two, or more personnel is a matter of debate. One person vehicles can allow more points to be monitored at the same time. For example, one car covering each direction of travel from a location that can exit at a four-way street can be done with four officers. Two man units may be ideal for having immediate back-up and an extra set of eyes but the continued costs of manning units to that extent can drain investigative funds rapidly. Agencies must also face the economic reality that most surveillance units are normally manned by a handful of officers, usually 6 to 10 in a squad. With the normal course of everyday law enforcement duties this may mean at any time team members may be on vacation, at training, or having to complete other duties which will impact the number of officers available to conduct surveillance. Depending on the number of officers working a surveillance detail back-up response times will vary. In the April 8, 2011, incident detectives were able to reach the officer who was shot within 30 seconds to 1 minute. The time frame from when the officer was rammed and shot was about 15 seconds, according to initial reports. According to initial reports the officer who was shot had made several attempts to retrieve his firearm while being chased. On three occasions the officer attempted to get his weapon in a position to fire but was unable to because his vehicle was rammed each time. The second vehicle was able to fire a shot off before the officer had the time to fire his weapon. In review of the April 8, 2011, shooting the officer was using a vehicle that was unable to outrun the target’s vehicle. All agencies are facing budget limitations on what type of vehicles they can purchase or use for surveillance units but agencies should also be cognizant of the need for their vehicles to perform when needed. Vehicles used in law enforcement related duties must be able to maneuver to get officers out of dangerous situations. Every agency and officer must decide if and when they will wear body armor during undercover or surveillance operations. This is often times a personal choice left up to the individual officer. Agencies may also have their own policy and procedures in place on the use of body armor. In the past officers who did not wear body armor often cited that is was to just too bulky, too hot, too heavy, or uncomfortable to wear during these types of operations. Manufactures have made great strides in creating vests specifically for undercover use that have addressed these concerns. Companies have even created clothing that is body armor and used by government officials and corporate executives in countries that have experienced a large number of kidnappings or assassinations. With the noticeable trend and intelligence being gathered across the country of criminal organizations specifically targeting law enforcement personnel for assaults or assassinations, the increased use of body armor should be addressed by agency heads and unit supervisors. As with any item purchased by a law enforcement agency the financial cost is always a key factor in deciding to purchase an item or not. The cost, not only financially but also emotionally, on a department when an officer is injured or killed should be considered when deciding to purchase this type of equipment for surveillance or undercover operations.